Drinking water to lose weight is vital to your lifetime fat loss low glycemic plan. Why do you think that is? The answer may surprise you. When you get the water your body requires it will be a source of energy and you won't need as much food! Drinking a lot of water is a key component to permanent fat loss. It's the simplest technique there is to lose the extra fat that has been accumulating over the years! Does it work? Absolutely. It's IMPOSSIBLE to lose fat unless you are drinking enough water. When you drink more water you are less hungry. And when water is used for energy the body doesn't need to store fat. Water is an essential nutrient and needed for every function in the body. In fact, dehydration can cause disease and weight gain. Good hydration is indispensible for good health. If you have fat to lose the very first thing you need to do is start drinking enough water. You need two quarts of filtered water a day and more if you live in a hot, humid environment or in a hot, dry climate. It's easy to drink that much in these types of climates. And it's much easier to drink a lot of water if you are exercising vigorously every day. When you perspire you lose a lot of water. On the other hand there are a lot of people who are chronically dehydrated because they never feel thirsty or because they drink only sweet drinks. They are ill or they are overweight because they are dehydrated and they have no idea that all they need to do is drink more water! Is that you? If you drink a lot of sodas, tea or coffee you very likely fall into this category. Your cells don't subsist on chemical fluids - they need water. A system to lose fat drinking water. Here is a system for drinking at least 2 quarts of filtered water every day. The very first thing you do is decide to substitute pure, filtered water for every soda, diet or otherwise you are drinking now. Once you have given up sodas you can institute the following system for getting enough water. When you wake up in the morning have a glass of water on your night stand. You have been asleep and not hydrating. The first thing you need to do is replenish all your organs with water. Fill up 2 quarts with filtered water and drink it all day. Have a glass of water after breakfast. Have another one at 11:00 a.m. Remember, you are drinking water to lose weight. By lunch time you will have had 4 glasses or one quart. Drink a glass of water before you exercise and a glass of water afterward. Drink a glass of water 1/2 hour before you eat a meal. Drink one after a meal. You will find that the more water you drink the more aware you will be of your thirst. When you don’t drink enough you lose your capacity to feel thirsty and you will not be well hydrated. You have to be drinking water to lose weight! When you first start losing weight it will be water weight. You are going to hit a plateau after that. This is when people often give up. Do not abandon your new good eating habits! This is the time to stay the course because the fat will start coming off now but it can be a very slow process. You have to be patient and have faith in the wisdom of your body and the quality of the fuel it needs. There are toxins in your fat cells! You are going to be releasing fat and that fat in many people is toxic. In order to detox properly through enough elimination you have to be drinking enough water. No matter what else you do to detox, water transports the toxins out of your body. When your body starts using fat stores for energy because you are eating the right foods and you are moving enough drinking 2 quarts a day will be critical for you to eliminate these toxins. You may feel uncomfortable for a few days. The cleaner your diet the easiest this stage will be. Eat as little as possible and drink as much water as you can and it will pass. In his most interesting book, Your Body's Many Cries For Water, F. Batmanghelidj, M.D. tells of letters he received from several readers who, inspired by the book, gave up their favorite soft drinks for water. All of them said they lost between 30 and 45 pounds in weight. One woman lost 58 pounds in less than a year when she substituted filtered water for Mountain Dew sodas! Water fills you up so you eat less. Studies have been done showing that drinking enough water prevents over eating. When you are hungry drink a glass of water. People often mistake thirst for hunger. Follow the water drinking schedule above and give up your addictions for sweet drinks. This alone could trigger an enormous loss of fat! Instead of drinking fruits always reach for the whole fruit so you are getting the pulp, fiber and live enzymes. Then drink some water. You need to be drinking water to lose weight and to prevent disease. We cannot live without water. You can live a long time without food as long as you are drinking water. The more water you drink the less room there will be for food and the less food you will need for energy. Drinking water to lose weight needs to be front and center of your low glycemic plan. If you haven’t switched from high glycemic beverages to water, NOW is the time. Fill up 2 quart jars of water in the morning and start drinking! This is a week of menus for low glycemic eating. It includes the very important low glycemic snacks and the number of calories per meal. Portion control is essential for good weight management. You need a standard of measurement, the serving size, for your reality check! Also includes low glycemic snack ideas! These are the ones you need to avoid! 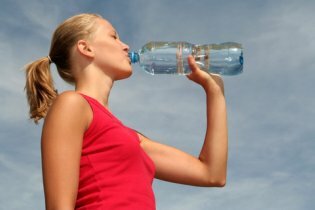 Return from Drinking Water to Lose Weight to Calorie Counter. Return from Drinking Water to Lose Weight to Lifetime Fat Loss home page.